With an aging population and managed care looking to trim costs, the Non-Emergency Medical Transport business is growing. Armel Possi does an excellent job of detailing how to start and maintain an NEMT business in his slim new volume. Possi was a successful businessman before discovering the NEMT business, and it is evident in the structure of the book. The author presents a detailed, sequential plan, working his way from the basics of NEMT into the finer points. He defines the business, the market, the nuts–and–bolts of setting up the business, and the agencies and partners one deals with (of particular importance: state government agencies). He then goes on to detail the finer points of NEMT, such as equipment maintenance, coordination of staff and communications, and specialized software. He culminates the book with a chapter on a day in the life of an NEMT business, which succinctly brings together the concepts outlined in earlier chapters. Lastly, he provides appendices with NEMT resources, including a list of State Medicaid Directors (which is invaluable to a business dependent on state government and Medicaid). The book is not without its flaws. One questionable piece of advice—which detracts from an otherwise insightful chapter on employee relations—is to attempt to conduct an exit Interview with an employee you’ve just fired. Possi states that “it may teach you something you should know.” But it is far more likely to lead to legal issues, if not outright violence. One is better off following the standard practice of removing the dismissed employee from the premises as quickly as possible. Of lesser importance, is the misspelling of the word “Facilitator” (as “Fasilitator”) in large type on a graphic. These can be forgiven, however, as the book’s useful content far outweighs such flaws. 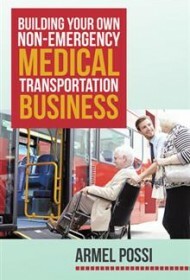 For anyone considering launching an NEMT business, this is a book well worth reading.